Our Texas Governor, Rick Perry, made a splash with a speech given in New Orleans at the Republican Leadership Conference over the weekend. The Sunday talk shows buzzed about the passion he stirred in the audience. In a 25 minute address, Perry touched on many of the top button issues bridging social and fiscal conservatives with the Tea Party. Pro-Life, Economics, Spending, Voter Integrity, Obamacare, the Tenth Amendment and American Exceptionalism are just a few of the big topics to which the crowd actively responded. For Texans, this speech reminded us of many given by Governor Perry over the last election cycle. While he might not be known well nationally, the importance he places on many of these top issues is not new. He has been focused on these topics for several years, but only now is gaining a national audience as rumors that he will join the GOP primary rise to the surface. Specifically, Perry mentioned that Texas is the top exporting state in the nation and 47.8% of all jobs created in America within the last two years have been in the Lone Star State. 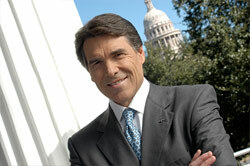 Perry stated his simple economic guiding principles he has followed in his 10 years as Texas Governor. 1. Don't spend all the money; 2. Keep the taxes low and under control; 3. Have regulations that are fair and predictable so business owners know what to expect from one quarter to the next; and 4. Reform the legal system so frivolous lawsuits don't paralyze employers that are trying to create real wealth. Over the last 10 years this recipe allowed Texas to reap economic success that comes with job creation and a job friendly climate. In dealing with the nation's economic crisis, he said, "You can't defer tough decisions to tomorrow's generation." What Gov. Perry did so well in this attention getting speech, was promote American values and it's greatness. He passionately reminded us that the American dream is still alive and attainable. We will have to work hard to make serious changes, but America is strong and a government ...of the people, by the people, for the people. The GOP primary offers a real opening for Rick Perry. With this speech, he differentiates himself from so many of the "top-tier" GOP candidates by showing his experience, his values and his enthusiasm for our great nation and the American people. Governor Rick Perry has made my 2012 Watch List for GOP Presidential Candidates. Is he on yours?